Asus and Google are now rolling out an $85 Chrome OS-based answer to the Intel Compute Sticks. Windows and Ubuntu Linux are no longer the only two PC flavors you can plug into the back of your PC—now there’s Chrome OS as well. 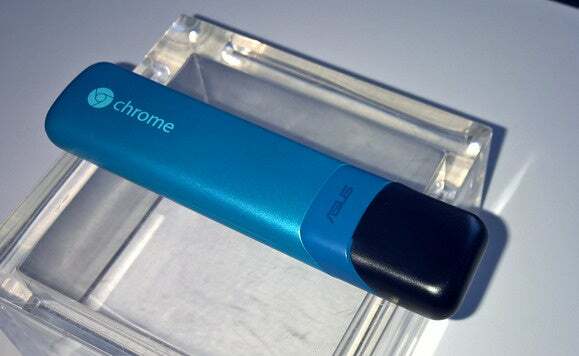 Asus and Google are officially rolling out the Chromebit on Tuesday after first announcing the device in the spring. 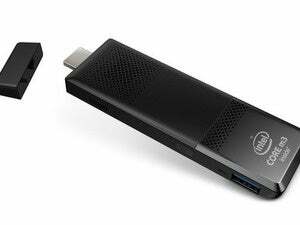 Like the Intel Compute Stick, the Chromebit fits into the back of your TV set via an HDMI port. Instead of a Windows desktop on your TV, the Chromebit displays the Chrome OS interface. The device comes with 16GB onboard storage, 2GB RAM, and an SoC from Chinese firm Rockchip. The Chromebit will set you back $85, according to TechCrunch, which puts it under the promised sub-$100 price. Asus’ Chrome OS mini-computer features one USB port for wired peripherals, but Bluetooth works as well. The Chromebit will come in black or orange and will be sold by Amazon, Fry’s, and Newegg. At this writing, the Chromebit was not available in any of these online stores ,nor was it in the Google Store. The story behind the story: Although we couldn’t find much use for it in our review, several computer makers have come out with computers on a stick in 2015. 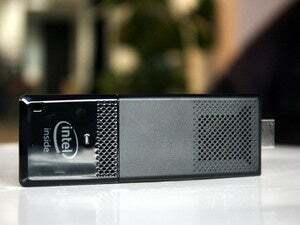 Intel already introduced its first Compute Stick revision in September, as well as rolling out an Ubuntu Linux version. In June, Archos announced (but has yet to roll out) a $100 Windows 10-based stick. Lenovo also has its Ideacentre Stick 300 first introduced in June. Although available to consumers, the real market here appears to be enterprises and schools where a single computer on a large screen can be helpful for large team projects. Chrome OS or Windows on a stick? With a relatively cheap $85 price, Chrome OS looks like an attractive option for TV-based computing, as long as everything you need is web-based. The one thing you probably wouldn’t want to do with this stick is use it as some kind of home entertainment PC. While it can handle Netflix and the like, that is still a job better served by the cheaper Chromecast paired with a smartphone. Currently on Amazon, Intel Compute Sticks range in price from $115 for an old Windows 8.1 version to closer to $145 for Windows 10. Lenovo’s Ideacentre Stick, however, is priced at $100 with Windows 10 and a 1.33GHz Intel Atom Z3735F processor. At $85 the Asus Chromebit is priced awfully close to a full-fledged Windows 10 PC on a stick thanks to Lenovo’s pricing. Whether a Chrome OS device is worth that much depends on how invested you are in Google’s ecosystem and whether you really need a Windows desktop for those times only a TV and mini-PC combo will do.